San Bernardino County joins with Los Angeles County in the best camp in Southern California. 4-H Summer Camp is an Accredited Camp by the American Camping Association (ACA). 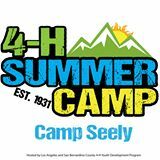 There are only 51 4-H camps in the nation that have achieved ACA Accreditation and the LA County 4-H Summer Camp is the only accredited camp west of the Mississippi and has been ACA approved for over 25 years.